is led by a dedicated team of volunteers. recognizes that the youth in our county will make ecological impacts on the future. Birding is an ever changing, world wide scavenger hunt! has numerous hot spots around the county to explore. The interactive map will take you to the latest eBird lists for that location. hosts a wide variety of field trips and meetings led by members and the leadership team. publishes six newsletters a year. Newsletters dating back to 2007 are found online. merchandise and gear is coming soon! The Harford Bird Club, a division of The Maryland Ornithological Society, has been active in Harford County and the state of Maryland for over 75 years. Our mission is to encourage and promote birdwatching and conservation in Harford County, Maryland. 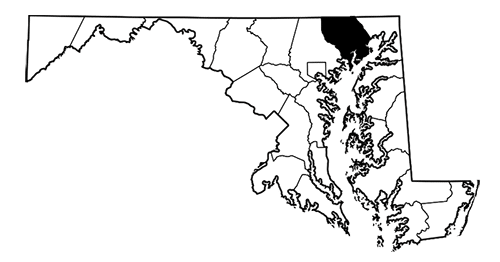 Harford County is located in the northeast part of Maryland at the head of the Chesapeake Bay and offers a diverse habitat for both breeding and migrating bird species. With the Chesapeake Bay and the Susquehanna River on the eastern border and Little Gunpowder Falls on the western border there is a variety of habitats. Four State Parks: Susquehanna, Palmer, Rocks and Gunpowder; as well as Eden Mill, Harford Glen, and Conowingo Dam offer excellent birding opportunities. Harford County is home to a wide variety of habitat for resident and migrating birds, boasting 325+ species on our official county checklist, we proudly spot rarities and add new species to our county list on a yearly basis. Interested in hearing about rare bird sightings in Harford County? We hope you enjoy your visit to Harford County, explore our birding hotspots and take advantage of our diverse habitats. In addition to a very active calendar of field trips, we host six meetings a year which include social interactions, a short, fun business-like meeting and a notable guest speaker sharing his or her love of the avian species. JANUARY: 6pm on the second Friday in January at Churchville Presbyterian Church. MARCH: 6pm on the first Friday in March at Churchville Presbyterian Church. JULY: 6pm on the second Friday of July at various locations year to year. NOVEMBER: 6pm on the first Friday in November at Churchville Presbyterian Church. If Harford County Public Schools is closed or cancels evening activities the Harford Bird Club meetings and trips will also be cancelled. Birds flock to Harford County each year to take advantage of the proximity to water, variety of habitat and abundance of food sources. Species such as Snowy Owls, Black-Throated Gray Warblers, Iceland Gulls, Rough-legged Hawks and Hudsonian Godwits have been know to stop over and enjoy the scenery. Every year rarities are spotted and reported on eBird and our own local listserv. Want to know what’s being seen? Set your alerts on eBird or sign up for our listserv. Click Here for details on when to report a rarity. The Harford Bird Club offers three easy ways to stay up to date with the latest sightings in Harford County. Do you love to get outside? Do you love to watch birds? Then come join the Harford Bird Club Young Birders. Enjoy our fun, family-friendly field trips and activities throughout Harford County. Get the latest sightings and news from The Harford Bird Club sent straight to your email.